Careful now, we don't have a liquor license. "Those other twelve say YOU'VE got the tab." Cut it out. It scares me to death when you make the moose talk. "We ain't puttin' up with no thorn-head rabble-rouser comin' around with all that extremist turn the other cheek--do unto others--if they turn you away shake off the dust from your feet--love your enemies--bless those who despitefully use you--pray for those who curse you--FATHER, FORGIVE THEM, FOR THEY KNOW NOT WHAT THEY DO hate speech." "No more splittin' fish dinners 5,000 ways." "I know you! 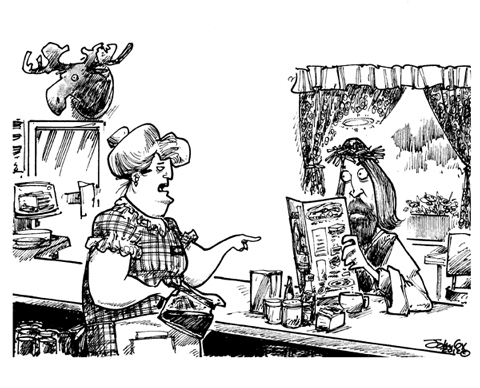 Back for more chicken fried bacon, huh?" "Is it intolerant to defend a religion that calls for death to infidels and then condemn their violence?" This is great without any words. "When the Christians riot in Atlanta it's all on you." NO! It's Friday, you'll have the fish and fries and like it! Yes, I successfully made it to my new home in Alaska. Will try to be on more..
"You'll have to order in sign language. Washington has a monopoly on red ink." Verily, I'd order the huckleberry pie with that coffee. It's to die for. Well, according to the DNC platform, neither you, nor your father exist. Can you heal a gas-fired Bunn-o-matic coffee maker? Can't find nobody to fix that old relic. This page contains a single entry from the blog posted on September 13, 2012 10:57 AM. The previous post in this blog was The Romantic.